This is interesting because the project cost (€4 billion) and size (1,058 MW installed) give an electricity sales price of US 8-12 cents per kWh, depending on the capacity factor, CF, (actual divided by maximum output). At 50 percent CF, and a 10 year simple payout, 10 cents per kWh sold is required. Fifty percent CF is easily achieved offshore, in the strong and steady winds that exist offshore. That 10 cent price meets the goal stated at the OTC wind sessions a few weeks ago. 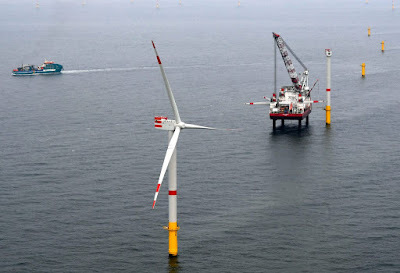 Ten cents is the lift-off point at which offshore wind projects need no subsidy and are built as fast as the manufacturers can produce the components.